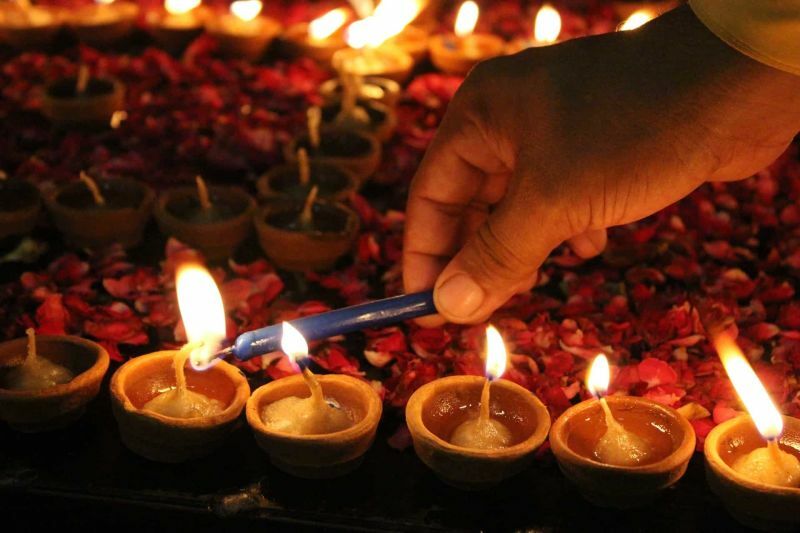 Tihar, also known as Deepawali, is a five-day-long Hindu festival of light which comes soon after Dashain. Houses all over the country are lit up with extra lights and decorated with garlands. Leaf dishes of rice, incense and light are set out for the dark messenger, while dogs are worshipped and offered goodies. On the third day is Gai Tihar with cow offered prayers and food in the morning, and Goddess Laxmi is offered elaborate prayers and puja in the evening. During this day, the Goddess of Wealth, is welcomed to people’s homes by making a path of footprints leading into the house. All lights are kept on and the doors and windows kept open to let in the goddess. Rows of lamps are placed along windows and doors, with the strong hope that Laxmi, the Goddess of Wealth notices and enters. The day also belongs to the cow that represents Laxmi. Bhai Tika is the day people look forward to. In some communities, sisters and brothers accept tika from each other. Bhai means brother in Nepali. Brothers and sisters honor each other and the sisters pray to Yama, the God of Death, for their brothers’ progress, prosperity and longevity. On this same day, Rani Pokhari Temple (see on Google Maps) is opened for those who do not have any brother or sister. This is the only time in a year the temple is open to general public. The brothers bring gifts to their sisters and the festival ends with feasting. It is also traditional to go from house to house singing Tihar songs and bestowing blessings, whereupon the residents of the house give money in return. Join the local for a great celebration! Prev PostWhat should you do when trekking with a Nepali porter?